Talk about getting mixed signals! The euro seems undecided with its direction for the past few days as conflicting economic developments have popped up in the euro zone. To begin with, European officials are divided on how they see the euro’s current trading levels. Take note that the shared currency has gained nearly 13% against the dollar after bottoming out around 1.2100 back in July last year. ECB Governor Mario Draghi doesn’t seem to be too pleased about this as he surprised market watchers by saying that the euro’s rally hasn’t escaped the ECB’s attention. During his latest monetary policy statement, Draghi emphasized that the central bank has been monitoring the economic impact of the euro’s movement more closely. He pointed out that further rallies could dampen inflation but that the strong euro isn’t a problem in itself. While some euro zone nations are comfortable with letting the market’s decide the currency’s value, others are urging the ECB to act more aggressively when it comes to keeping the rallies contained. France, for instance, seems to be open to the idea of coordinated currency intervention in order to curb the euro’s strength. Just a few days ago, French President Francois Hollande talked about setting a medium-term target for the euro’s value to prevent economic instability. Finance Minister Pierre Moscovici echoed this sentiment in saying that “strong action” is necessary to keep the euro’s gains in check. After all, if the euro keeps rallying at its current pace, it could shave off 0.3% of France’s overall economic growth. Now that’s something euro zone’s second largest economy can’t afford! Italy, the euro zone’s third largest economy, has also been showing concern regarding distortions in the currency market. On the other side of the fence, we have those who aren’t as worried about the euro’s rapid appreciation and would rather let the markets determine the currency’s value. One such official is ECB member Jens Weidmann, who recently dismissed talks of euro intervention and claimed that the euro isn’t overvalued at its current levels. Meanwhile, in an interview held last week, Luxembourg Finance Minister Luc Frieden said that he isn’t troubled by the euro’s appreciation, adding that its current trading levels are a mere reflection of where the economy is at fundamentally. But why is the euro exchange rate important anyway? It’s elementary, my dear Watson! Having a strong currency hurts an economy’s exports by making its goods less competitive in terms of price in the global markets. In fact, it’s estimated that a 10% increase in the exchange rate could lop exports by about 2.5%, according to a recent study conducted by JP Morgan. Over the next few days, it’ll be increasingly important to keep to date with developments on this tug-o-war over the euro. 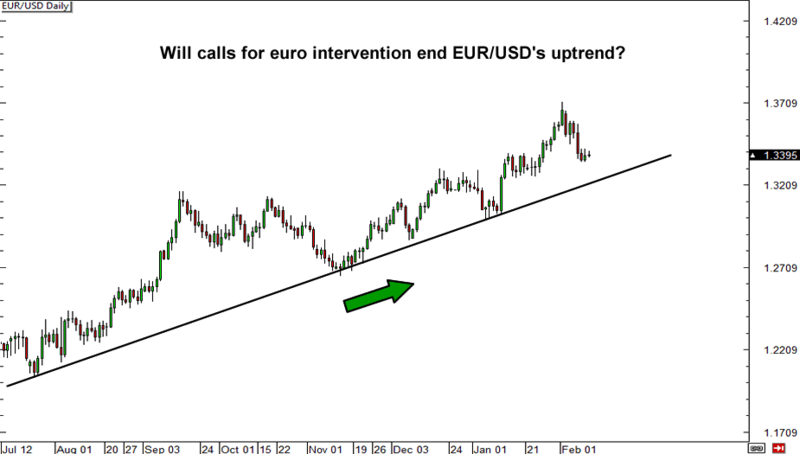 The winner could very well determine whether EUR/USD’s uptrend will stay intact or not. Do you think the euro’s rallies should be capped?